Difference Between Good Fats and Bad fats? Get your facts on Fats here. Hello Everyone! When we talk about fats we always get negative reviews. Fats is always thought to be a Devil. As we know that our body composite of Bones, Water, Muscles and Fats. So when we take care of the calcium to keep bones healthy, water to keep body hydrated, Protein for wear and tear of the body, equally fats are also important to keep major organ insulated from physical injury and also for bone lubrication. I would like to highlight that always fats are not bad. But the quality and quantity of fats decides wether your fat intake is doing good for you or its harmful. I always tell my friends, family and clients that all foods which are available and edible have some or the other function in human body. But just required amount by the body has to be known. Best person to know your body is you yourself. 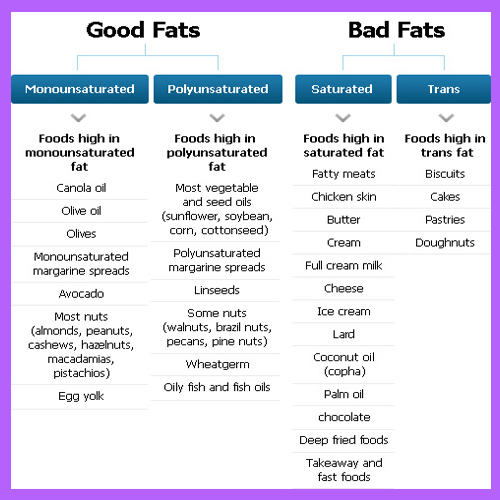 When we talk about fats; Broadly we categorize it into bad fats and good fats. Its easier to understand from the headline that bad fats are obviously bad for body and good fats are good. So how do you know that a particular fat is good or bad? To start with always keep an habit of reading the “Nutritional Facts” label on the package. That will help you to decide on the quality of fat. Fats are categorized as Trans fats, saturated fats and cholesterol present in it. There is also further classification which is little in detail and can be skipped. When you see high % of these components high in your fats and oils its time to change it. 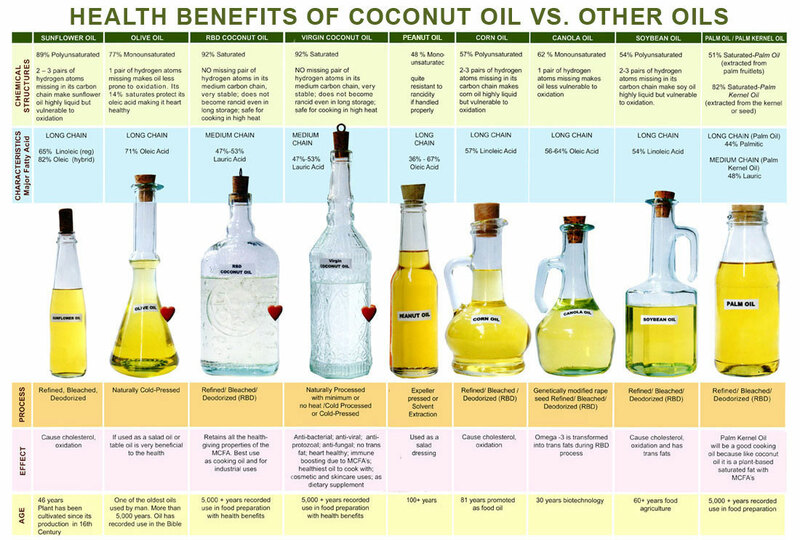 Check to know facts about your oil http://thehealingproject3.files.wordpress.com/2012/09/fat-chart-1.jpg. If theses fats are present over the limit recommended by FDA is hazardous to health. Majorly wrong fats leads to chronic heart problems. 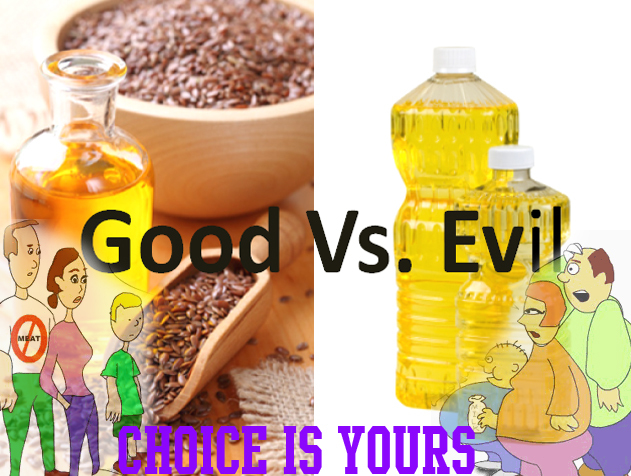 So a good oil would be the one in which Omega 3(linolenic acid): Omega 6(linoleic acid) ratio is maintained. Many a times oils and fats contain good amount of omega 6 fatty acid but they lack omega 3 fatty acid. Omega 6 oil is present in almost all vegetable oils but omega 3 oil best source is fish oil, falxseeds, canola oil.Omega 3 fatty acids have many medicinal properties and helps in reducing inflammation in the body and also provides lubrication between bones and also helps in brain development among children of growing age. Generally fats are present in almost all food groups except for a very negligible amount present in fruits and vegetables. So all food groups cannot be avoided. If you get to see the food pyramid you will see the top most smallest portion of diet should be fats. So comparatively to the other food groups fats should be in very less measured quantity. So if fats taken above the recommended quantity its considered bad even if the quality of fat is good. Analyse your diet and check wether you are on right path of fats. * Total fat intake in diet should be less than 30% of total calories of your diet. * Total saturated fat intake should be less than 10% of total calories. * Total cholesterol intake should be less than 300mg/day. * Choose lean meats over organ meat. Poultry are also good option. * Fish is a good source of high quality oil. * Read Nutritional facts label carefully. 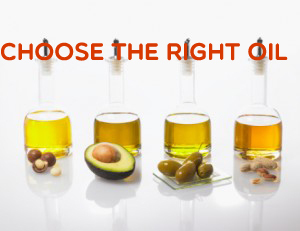 * 3-4 Tsp of fats/day is adequate for a healthy diet. * Handful of nuts per day are allowed as they have good fat and are rich in phytonutrients. Body fat percentage of a healthy man should be less than 24% for men and less than 30% for women. Body fat percent denotes the fitness level of an individual. Check your health status here http://www.healthstatus.com/calculate/bfc. I hope now the facts of fats are cleared. In case of any queries, doubts, suggestions please drop a comment or contact us. Benefit of flaxseeds and its importance. 12 Responses to Difference Between Good Fats and Bad fats? Get your facts on Fats here. and give you a shout out from Humble Texas! Just wanted to tell you keep up the excellent job! Please also seek advice from my web site =). We can have a link alternate contract among us! Excellent, what a website it is! This blog provides helpful facts to us, keep it up. Hey! Thanks for the nice post, extremely informative. Subsequently, after spending many hours on the internet at the end, we found a person who certainly know what they are discussing thank you a lot many wonderful message. Good web site you’ve got here.. It’s difficult to find high quality writing like yours nowadays. I really appreciate individuals like you! Take care!! I’m gone to inform my little brother, that he should also pay a quick visit this web site on regular basis to obtain updated from most up-to-date news update.